The skirt is a great way to be a little adventurous, have fun. And these days, the Number #1 fashion tip for putting any outfit together is to "mix it up." That's easy with a skirt. If the skirt is feminine, try mixing it with a strong, tailored top. If the skirt is white or neutral, add a blast of color on top. For example, a feminine skirt like this Jones New York Floral Cutout Skirt ($139) might look great with a simple, man-tailored top--maybe black or a hot citrus color or whatever makes your complexion glow. Wear the blouse tucked in or out, depending on what flatters your shape, and with a belt. Here are a couple more skirts with trendy knife pleats. I love the print top with the color block skirt. Beall's online department store has a ton of mid-length or maxi skirts, most of them very reasonably priced. If, however, you've already got a closet full of skirts, you might be looking for something new and different. I love the diagonal ruffles on this next skirt. 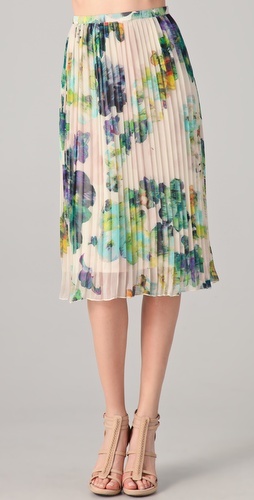 Again, I'd wear this skirt with a bold color or black top. Because of the ruffles, I choose a structured T-shirt with 3/4 sleeves. Click on the photo to see Beall's other skirts. The fashion pundits would have you mix prints--stripes with florals, plaids with polka dots, for instance--just as long as you keep a common color theme among the separates. Personally, I think that's a little risky for most over 50 women. Instead, I like the way this large flower print skirt has been paired with a simple two-tone sweater on the Shabby Apple site. This final skirt is probably a little over the top for most women over 50. But I think you can push the envelop with skirts, if you keep your top and jewelry simple, understated. This skirt is all the statement you need to make, don't you think?